*CORRECTED* Increasing profitability of farmers’ market booths, on-farm stores and agritourism enterprises will be the focus of a special training workshop for bison producers and other growers at 2:00 p.m. Friday, April 13, at the Upland Brewing Co. in Bloomington, IN. DENVER, CO (April 5, 2018) – The National Bison Association (NBA) has added a part-time staff member to fill the newly created Director of Communications and Outreach position. Karen Conley, Box Elder, S.D., has been selected for the position and began working with the current staff on April 2. Conley is a familiar face to many in the bison business, having just recently completed nearly two decades as the executive director for the Dakota Territory Buffalo Association and served on the NBA Board of Directors for five years, first as a director for her region and the last two years as the secretary/treasurer. “There is a widespread perception that the U.S. is at a disadvantage in the international marketplace because we have not adopted a national animal ID and traceability system,” says Thad Lively, Senior Vice President, U.S. Meat Export Federation and a featured speaker at the upcoming NIAA Annual Conference to be held in Denver, CO, April 10th & 11th. Interested in learning more about soil health and crop rotations for dryland farming? Join the Rocky Mountain Farmers Union for their workshop at the Lincoln County Fairgrounds in Hugo, CO on April 20th. There will also be afun day camp for kids going on at the same time. Refreshments and lunch will be provided, all are welcome. Sioux Falls, SD (April 5, 2018) – A controversial new video was released today, addressing fuel retailer concerns about potential liability for vehicle damage from the new E15 fuel on the flexfuelforward.com website. The video features current E15 marketers talking openly about customer E15 complaints and includes a collection of consumers who have had damage or had warranties voided by using E15. The video is the fifth in a series featuring current E15 and flex fuel retailers who share their experiences and answer common marketer questions about offering the new higher ethanol blends. 04-05-18 Take Your Best Shot & Enter the 2018 NFU Photo Contest! Take Your Best Shot & Enter the 2018 NFU Photo Contest! Enter Your Best Photo for a Chance to Win $500! 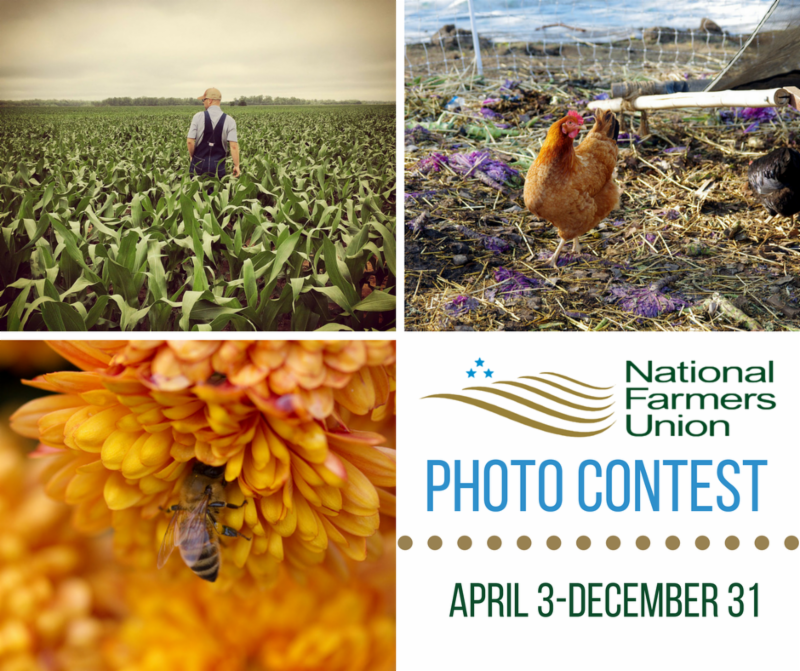 National Farmers Union is bringing back our popular photo contest! NFU members can submit photos in any of the monthly categories for a chance to win a 16″ x 20″ canvas print of their winning photo! At the end of the year, each monthly winner will be eligible for the grand prize – a $500 prepaid Visa gift card. Get your cameras clicking and submit your best photos today! Find eligibility, rules, and more information here. Get your cameras clicking and submit your best photos today! As expected based off recent events, the U.S. and China are headed for a trade war at the cost of U.S. farmers. China has included soybeans in its latest proposed retaliatory tariffs, following other ag products such as pork and ethanol. Those all stem from the Trump administration’s tariffs on steel and aluminum imports to the United States, and others proposed this week. The American Soybean Association expressed “extreme frustration” regarding the escalation of a trade war as China is proposing a 25 percent tariff on U.S. soybeans. ASA called on President Trump to withdraw the tariffs that caused the retaliation and engage with China in a “constructive manner.” American Farm Bureau Federation President Zippy Duvall says the tariffs are “testing both the patience and optimism of families who are facing the worst agricultural economy in 16 years,” adding “this has to stop.” China purchases 61 percent of total U.S. soybean exports, and more than 30 percent of overall U.S. soybean production. The National Farmers Union says the Trump administration needs a plan to help farmers through a trade war. With the latest tariff proposal including $50 billion of U.S. goods, including soybeans, corn, beef, and other agricultural products, NFU President Roger Johnson expressed concern “there is not a plan in place” to protect farmers. Farmers are dealing with depressed farm prices and a 12-year low in farm income, and a trade war will “undoubtedly make these conditions worse,” according to Johnson. NFU is urging the President to engage with Congress to develop a farm bill that will protect farmers and ranchers from the collateral damage caused by the developing trade war. Agriculture Secretary Sonny Perdue, who is traveling this we ek, said a plan is in the works, but so far has not provided any details. No one has officially declared ‘war’ in the way of trade between the U.S. and China, but the nations are no doubt in the makings of a trade war. President Donald Trump insisted that “we are not in a trade war with China.” However, China fired back a proposed list of tariffs less than 24 hours after the Trump administration rolled out a tariff proposal against China. While the proposal from China includes a 25 percent tariff on soybeans, market experts say it’s important to keep the soybean market in perspective. In a daily newsletter, Jim Bower of Bower Trading points out the phrase “do what China does, not what they say.” The latest tariffs by President Trump and China are not yet set in stone. Trump will seek comments on his proposal for 30 days, and China allows 180 days for negotiations before implementing the latest proposal. That time allows a chance for both nations to negotiate an agreement if desired. Bower, in his daily newsletter, points out that Brazil, another major source of soybeans, does not have enough of the commodity to fully supply China. And, the only major soybean growing areas of the world are North and South America. Future demand my shift, but global demand should not decrease, overall. The Department of Agriculture Wednesday announced it will prioritize two key grant programs to address opioid misuse in rural communities. Assistant to the Secretary for Rural Development Anne Hazlett says the focused investment will target USDA resources “to be a strong partner to rural communities” in building a local response to the opioid epidemic. USDA is reserving $5 million in the Community Facilities Grant Program and is giving priority to Distance Learning and Telemedicine Grant Program applications proposing projects to address the opioid epidemic in rural communities. Funding for both programs was made available through the 2018 Omnibus spending bill. USDA points out that the National Center for Health Statistics estimates that nearly 64,000 Americans died from drug overdoses in 2016. More than half of those deaths involved opioids, including prescription drugs and heroin. Learn more about the grants at www.rd.usda.gov. A new study shows a reduction in the foreign-born workforce, prompted by a change in immigration policy, would not be offset by native-born workers and permanent residents. Iowa State University economists say a tighter supply of foreign-born workers would reduce overall demand for workers. That’s because as production costs increase, agricultural output would decrease as farmers abandon labor-intensive operations. Commissioned by the National Pork Producers Council, the study shows the result would be a 3.4 to 5.5 percent decrease in the total number of farm workers. NPPC says skilled and unskilled foreign workers “have been crucial to maintaining and growing the workforce” needed for the pork industry, adding that if the current labor shortage continues, or worsens, the nation could see “animal health and well-being suffer.” NPPC supports legislation that would create a new visa that allows non-seasonal foreign agricultural workers to remain in the United States for up to three years while deferring a portion of their pay as incentive for periodic “touchbacks” to their country.